I’ve always been fascinated by a good paradox. 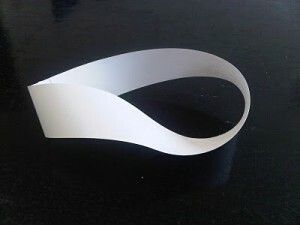 Whether it’s staring at the wonderfully impossible art of Esher, or trying to get get my head around an apparently 2 sided object which only has 1 – namely a Mobiustrip (which it really does by the way – try it). The barber shaves all the men in the village who don’t shave themselves. Assuming the previous statement is true, then who shaves the barber? The answer is paradoxical in that if the barber doesn’t shave himself, then according to the first sentence he must shave himself, else he does shave himself then according to the first sentence he mustn’t shave himself, which again is paradoxical. Anyway, I’ve never really thought of this fascination as much more than a trivial intellectual pleasure, but having just finished James Gleick’s ‘The Information – a history, a theory, a flood‘, I’ve been reminded not only of the beauty, but also the importance of a nice paradox. One example from the book which I hadn’t heard of before is Berry’s Paradox which can be described as follows. X = the smallest number not nameable in less than 11 words = 10 words! I find it fascinating that concepts like ‘true’ and ‘false’ consist of systematic ambiguity. We chase these concept every day of out lives and yet is it a futile race. 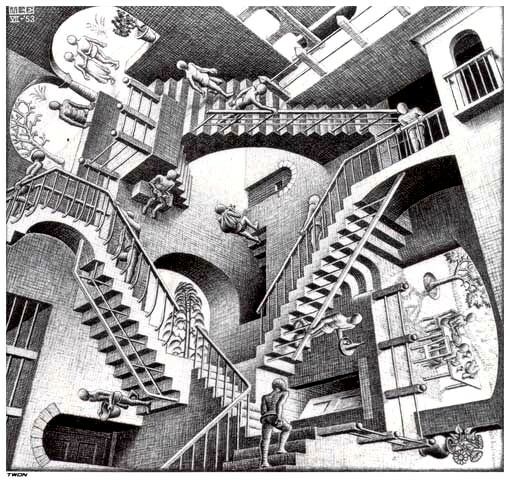 Anyway, what have all of these paradoxes got to do with open innovation which is what this blog is usually about. Well we’ve been thinking recently about how can we best codify what we do and it’s not always that easy. The one thing I would say we are good at is being comfortable with uncertainty. I often find it personally quite unsettling but basically the business of innovation is trying to navigate through uncertainty without passing judgement too early. I’ve lost count of the number of times I’ve been sitting in a meeting where people want to (or want us to) pass judgement on whether something is a good idea or not, to which the answer is usually, we don’t know yet. Whenever faced with a binary choice – left/right, true/false, creative/technical, public/private, black/white – remember the answer is always ‘both’. Similarly we run an exercise in workshops around breakthrough innovation where we invite people to figure out the underlying assumption behind an industry or a current business model, and then get them to flip the assumption and work up a new business model based on the inverted assumption. It’s amazing how often it yields really interesting results. For example recently we ran some innovation workshops around the Construction industry where one of the assumptions, in the UK at least, is that people would rather own their own home rather than rent. However flipping that assumption is not only both possible but also profitable – for instance the assumption that people would prefer to rent rather than own underlies the success of businesses such as Spotify and Zipcar. Finally we ran some sessions with a major UK cancer charity a few years ago who have a vested interest in stopping smoking for obvious reasons. So when somebody in a workshop came up with the apparently crazy idea of cigarettes branded by the cancer charity, you could see them visible flinch at the prospect. However to their credit they didn’t close down this line of exploration too early and it quickly flipped into branded smoking cessation patches instead which ended up being one of the projects they ended up supporting. reality you are generally your self not really completely certain of the assertion.